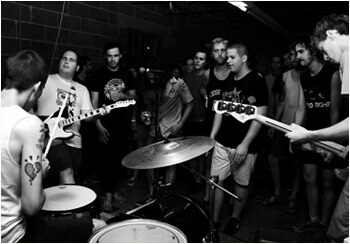 From West Chester, PA., Spraynard started in the summer of 2008 when three friends(Patrick Graham, Patrick Ware, and Mark Dickinson) felt the need for a resurgence of DIY music in their hometown. They combine passionate & urgent vocals with infectious pop punk in the vein of PLOW UNITED and OSKER. Their Asian Man debut called “funtitled” will be released on May 10th. They have a released a slew of 7 inches and an LP on Runner Up.